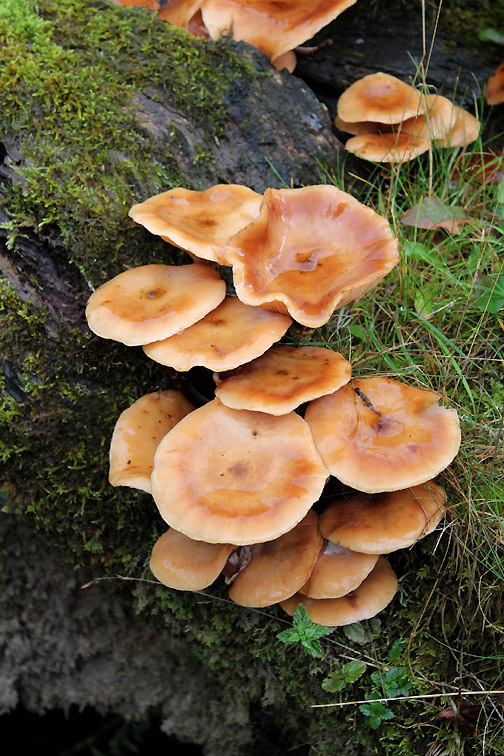 " Lowther Photo Exhibition and Walk "
Date & start time: Sunday 20th October 2013, 2pm start. Walk details : After the exhibition ... 2.2 mls, 250 ft of ascent, approx 1 hour. Highest point : The photos and exploring a new area. Weather : Overcast with occasional showers. 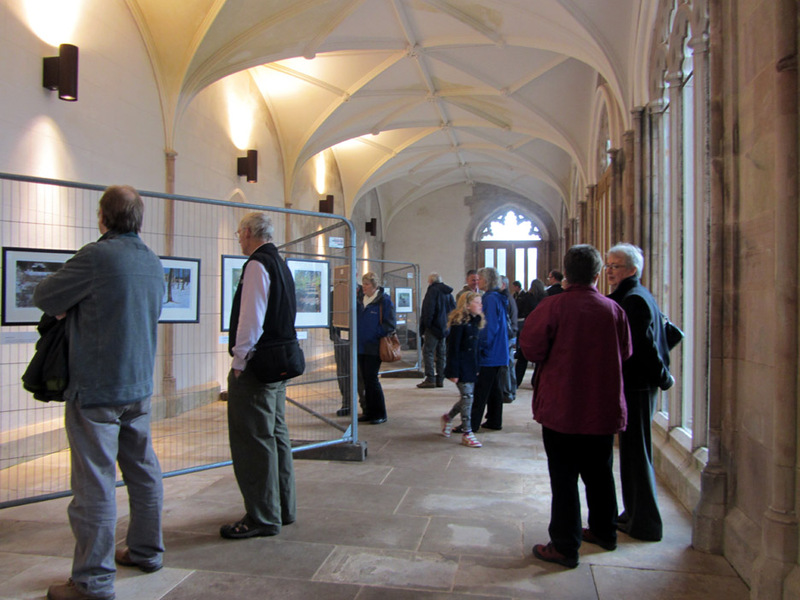 We had an invite to the opening of an exhibition of photographs, taken by a friend, which were to be displayed in the hall at Lowther Castle. 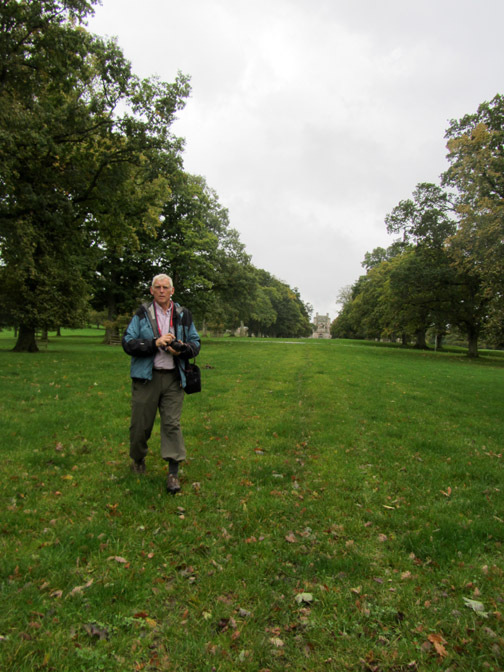 He and another artist were exhibiting for the first time at the castle, the subject being Lowther Park and its gardens. We joined them on the Sunday afternoon for the official opening. First find the Castle . . . despite having seen it in the distance many times we had never actually been there. It wasn't that difficult . 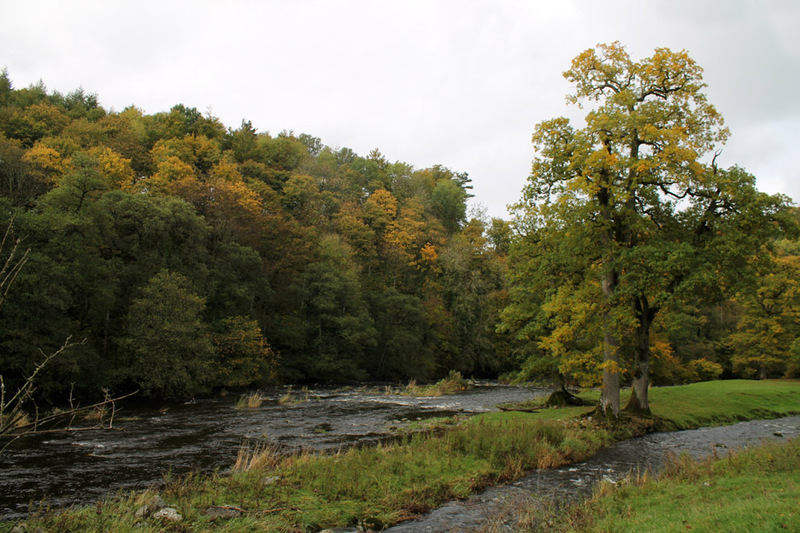 . . drive to Penrith and take the A6 south for three or four miles. 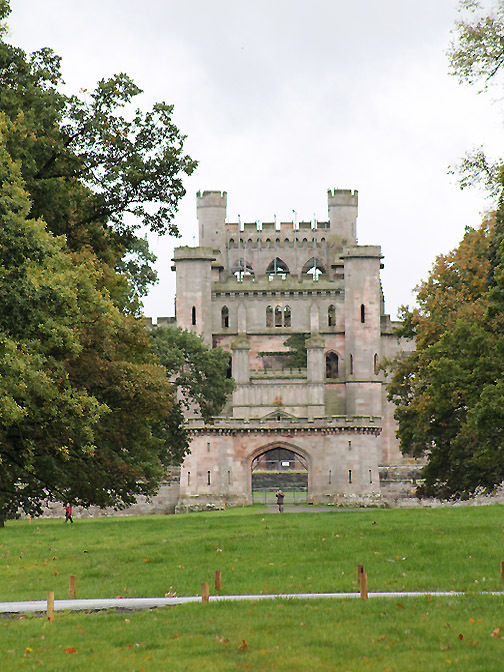 Don't take the grand entrance to Lowther Holiday Park but follow the signs indicating right a bit further south ! 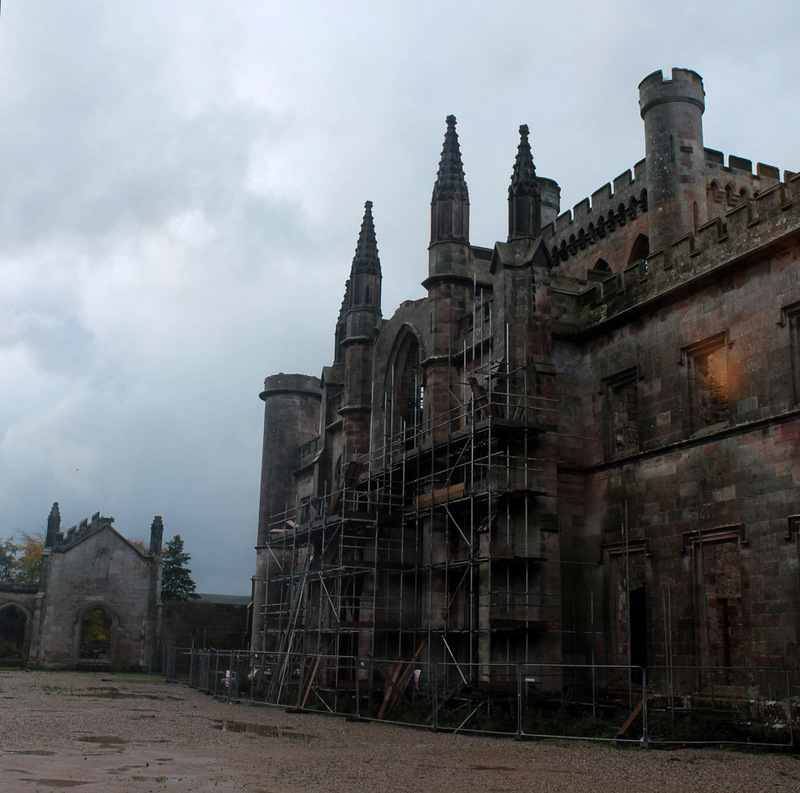 The Castle has seen better days but renovations are in hand . 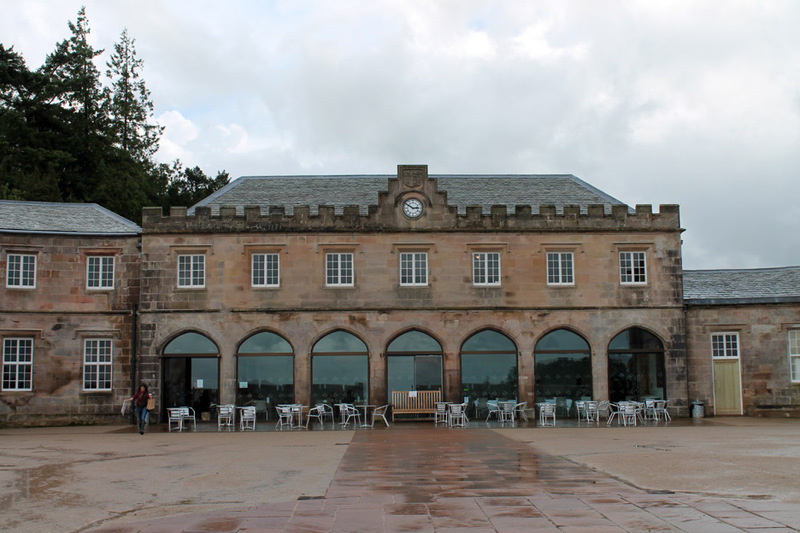 . . this is the new cafe and visitor centre. 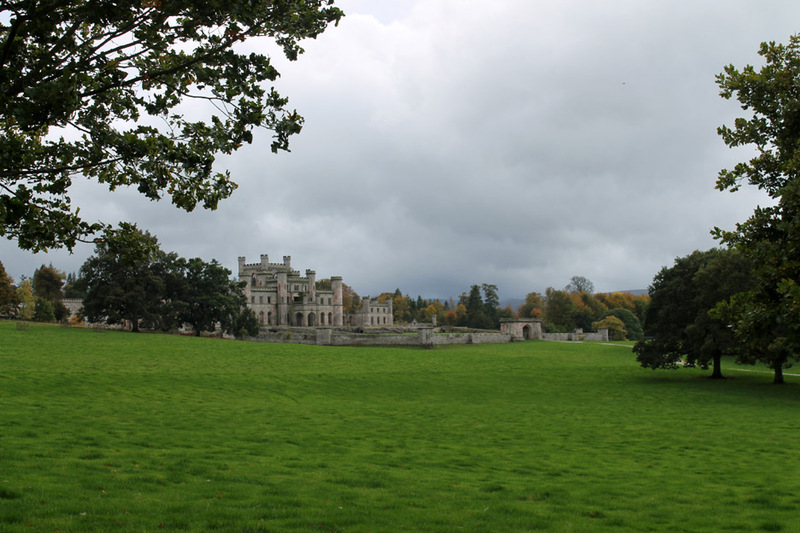 Unfortunately the main building was made derelict after the war and the remaining contents sold off in a grand "stately home" sale at that time. and return a little life to the castle and its fine gardens once again. 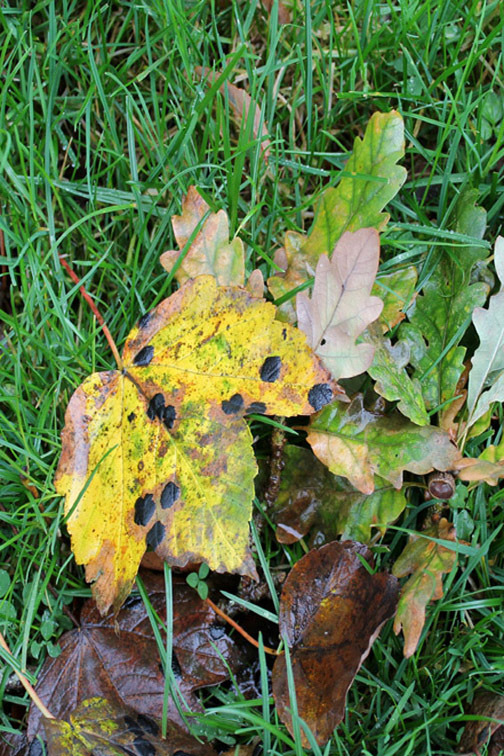 It was those gardens that have inspired Andrew and Christine to explore and record what they have seen. 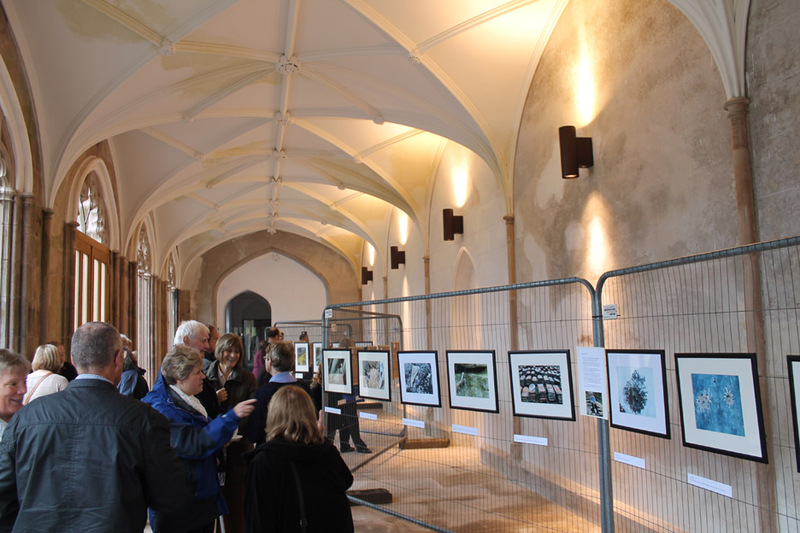 Today is the culmination of their ideas, drawn together into an exhibition which is currently open to the public. I can do no better than to quote from Andrew's site . . .
and relaxing place to explore and they provide a wealth of opportunities to create images, which catch his eye or reflect his mood." The second set of photos today were by another enthusiast of Lowther Gardens . . .
and small creatures to convey deeper feelings. 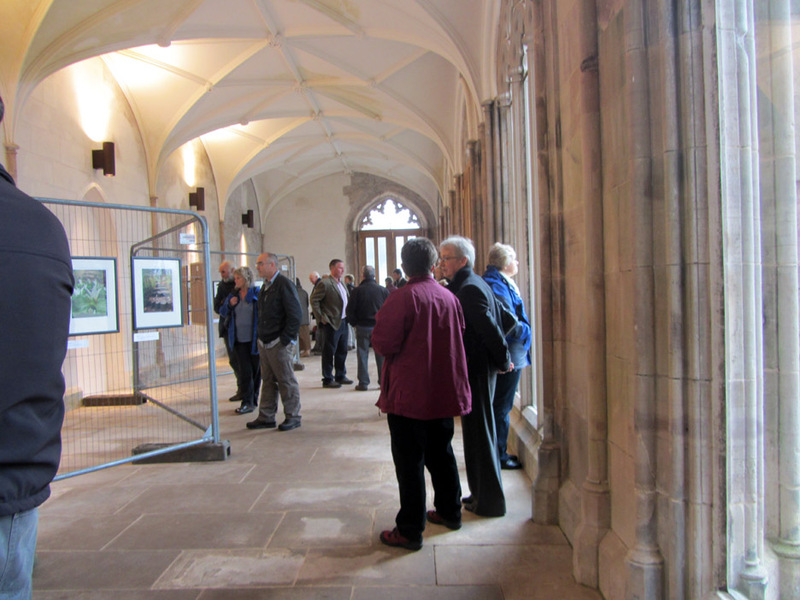 Photography has been an enduring love, exhibiting work with the Penrith Camera Club. 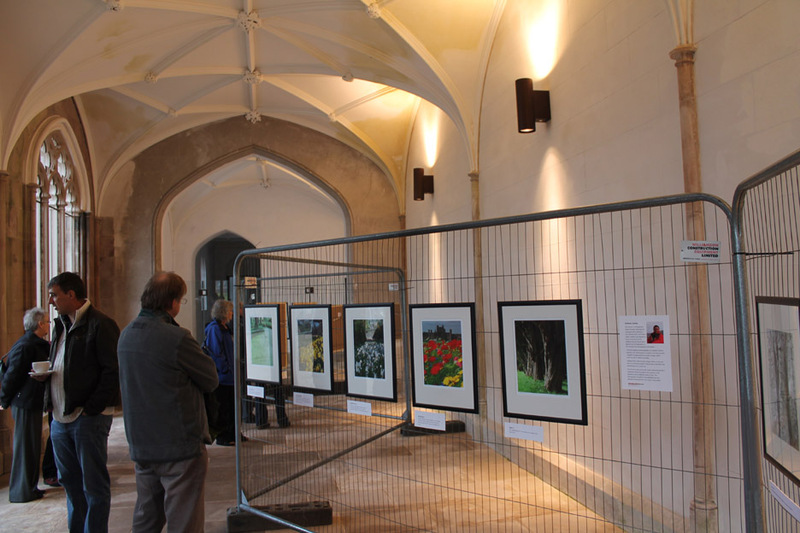 The exhibition has been staged in the renovated hallway of the Castle. For those who may have been wondering . . . a rare picture of the web-master David Hall who was also at the opening. He's the one with his hands in his pocket. I can't say anything . . . I had mine in my pockets in the previous photo ! Behind, wearing an open jacket, is Andrew himself, also with hands in pocket . . . must be a 'bloke's' thing! Do go along and see them for yourself. We were inside where it was warm and dry. 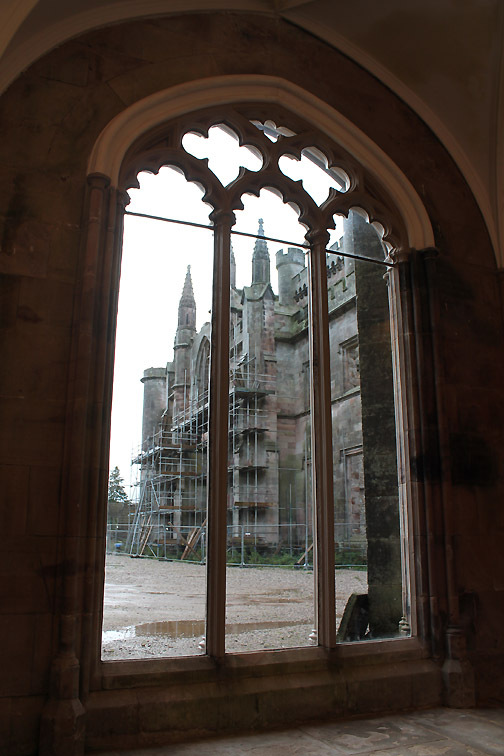 the old castle buildings undergoing renovation. 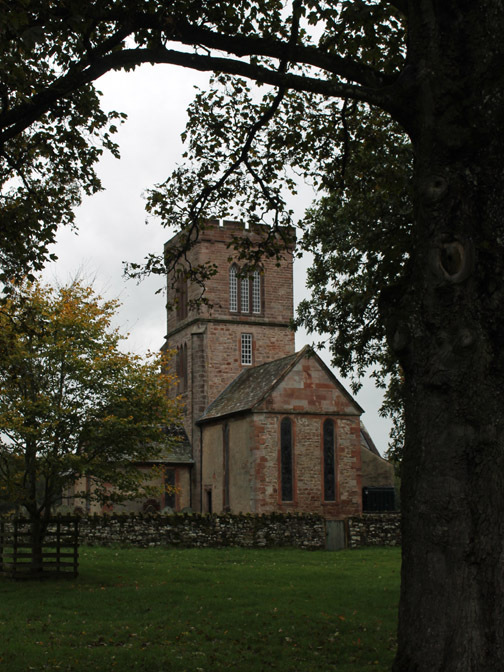 It will be a long time and a lot more money will be needed to renovate it further. 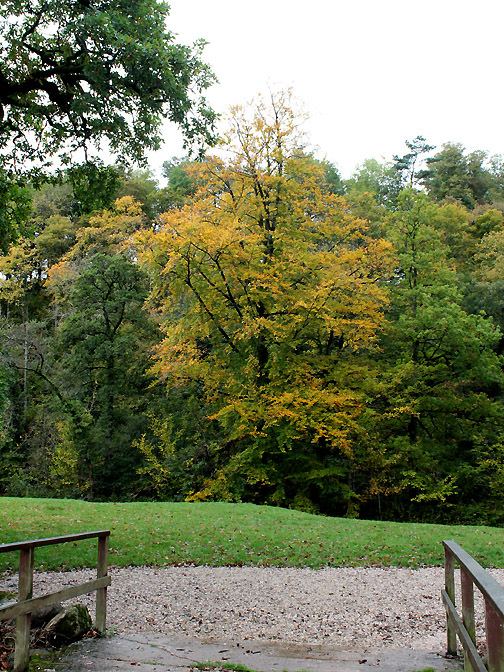 This is the view of the Castle from the front ramparts on the northern side. 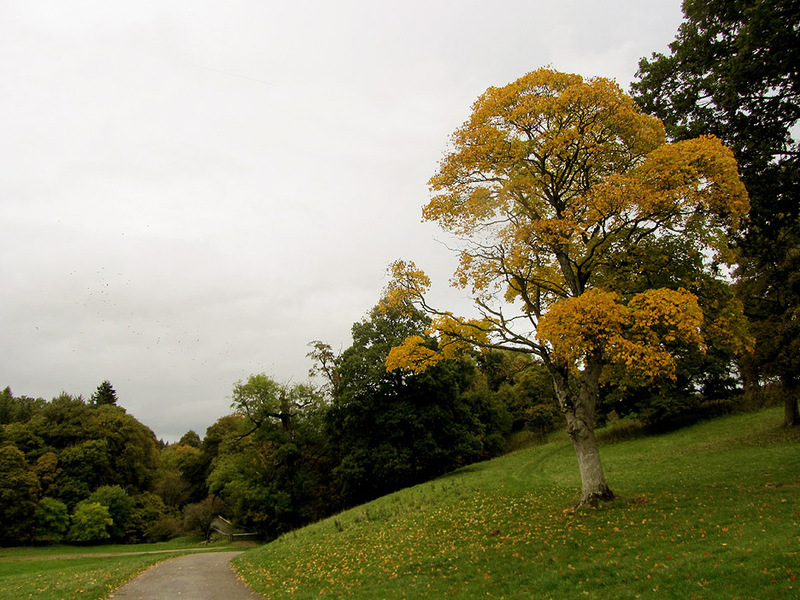 The gardens are open on a daily basis and the parkland is often home to shows and events. For more information, including opening time and facilities on offer . . . please click here, on the photo above, or phone 01-931-712192. 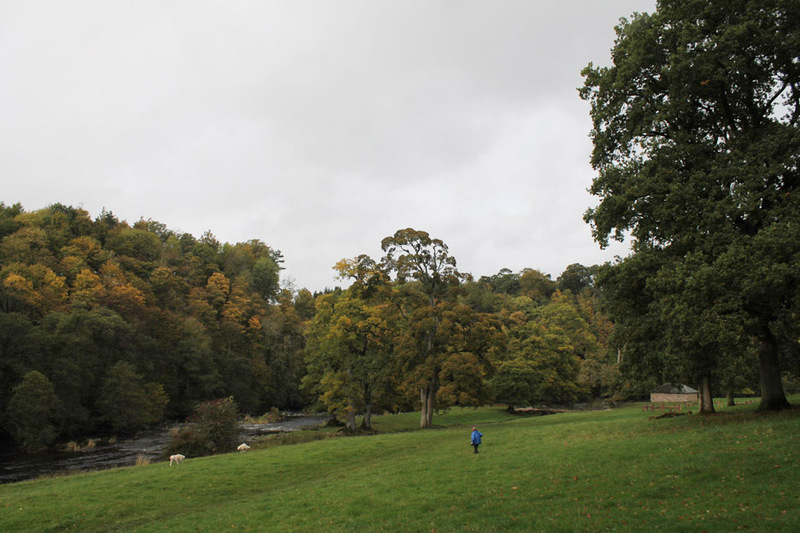 Ann and I venture out into Lowther Park to give the dogs a walk. 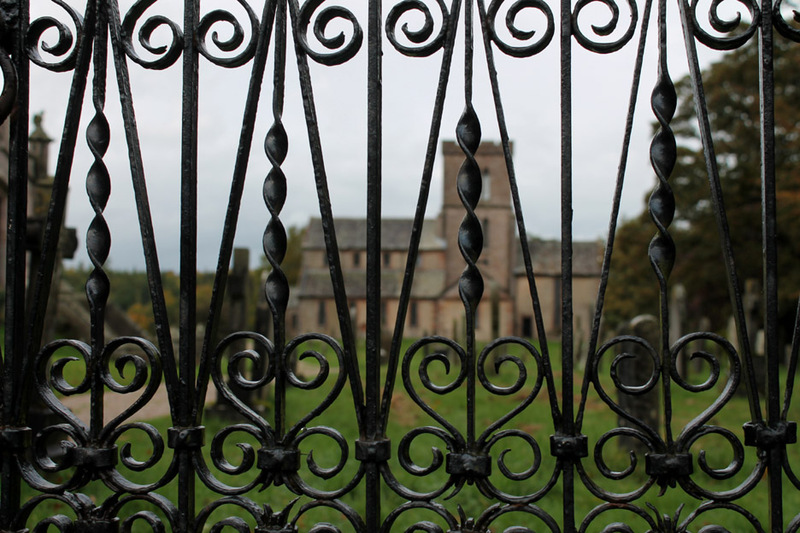 Arty picture of the gate . . . these exhibitions are getting to me ! 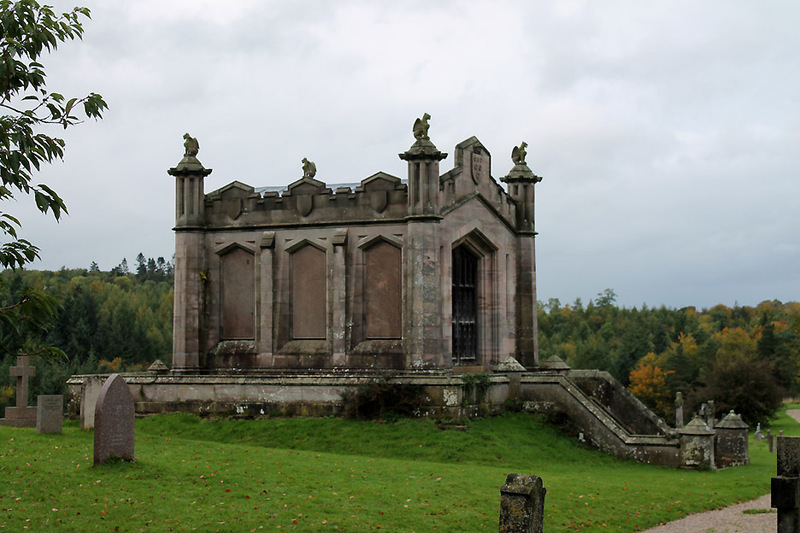 In the churchyard is the Mausoleum of William the second Earl, who died in 1844. We head off down the avenue of trees leaving the impressive facade of the castle behind us. It must have been an impressive structure in its heyday. Others are taking pictures too. Time passes . . . the Castle recedes into the distance. Autumn leaves are falling . 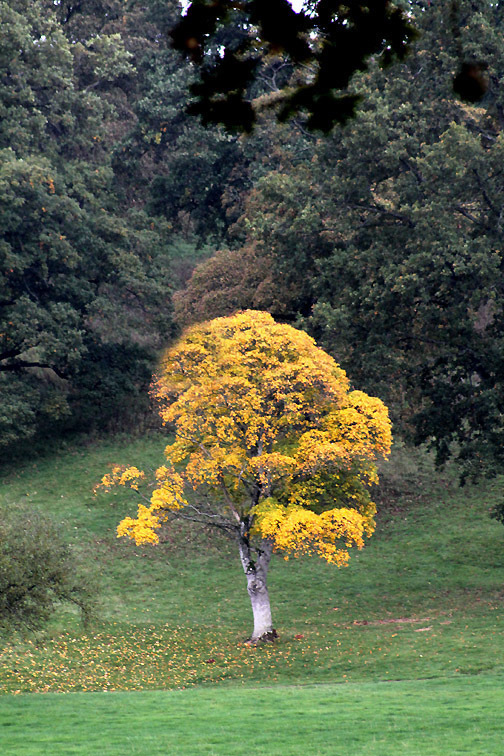 . . oak and sycamore litter the floor . . .
. . . but the Maple stood out like a beacon of colour across the park. We're further down now . 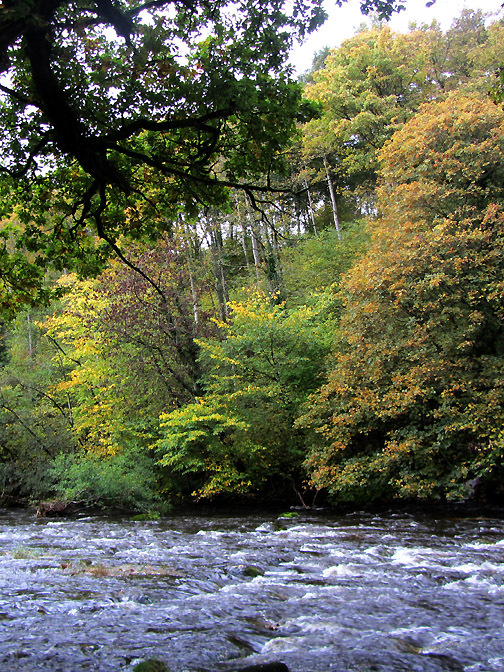 . . by the River Lowther that flows through the grounds. 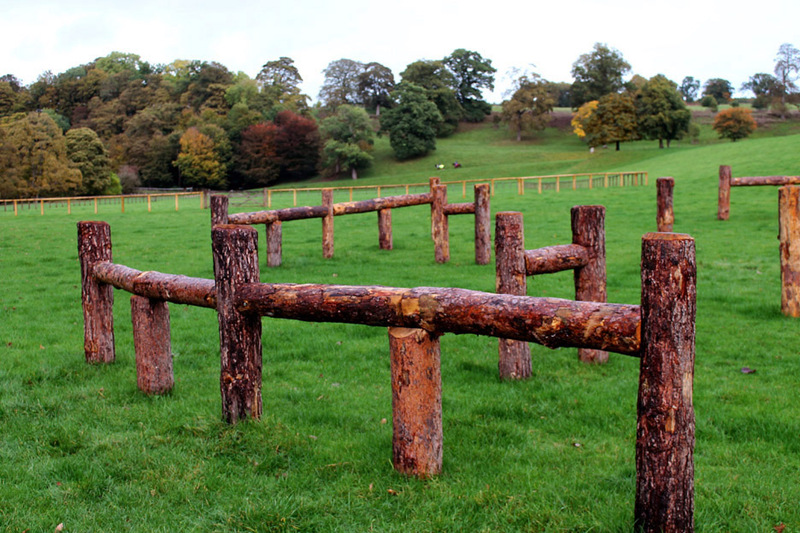 A stable and pony ring with this interesting but unexplained arrangement of rustic poles. Maybe it is a set of perching posts for people or an agility obstacle course for dogs . . . answers on a postcard please ! The river at this point splits to form an island. With the recent rains both channels are flowing fast. 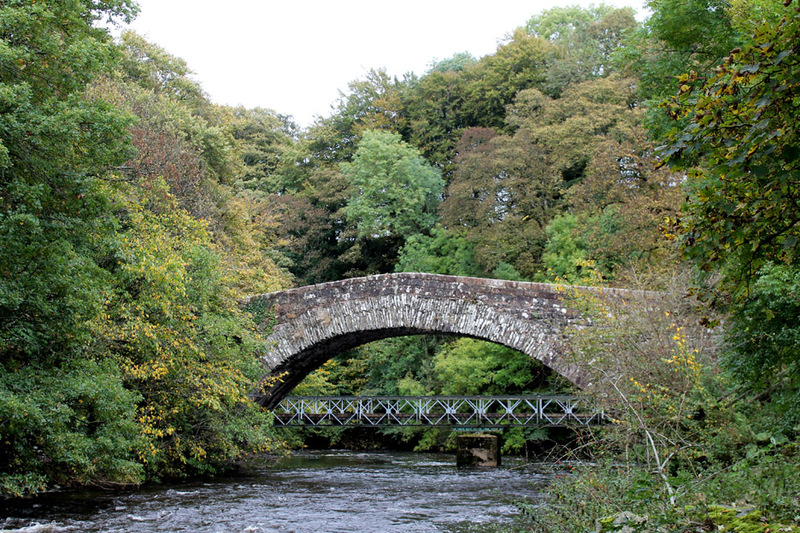 Lovely colours are starting to develop on the trees . . .
. . . as seen here across the bridge onto the island.
" Grand weather for ducks " as the saying goes . 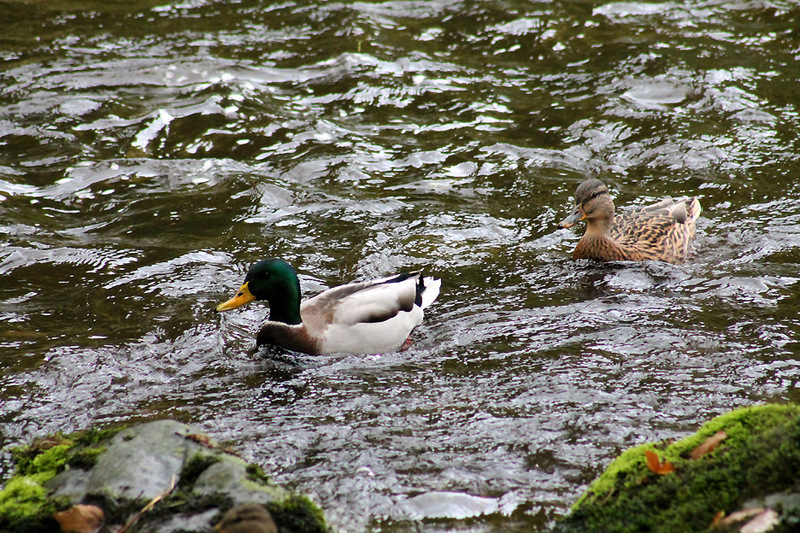 . . Mr and Mrs Mallard I believe. 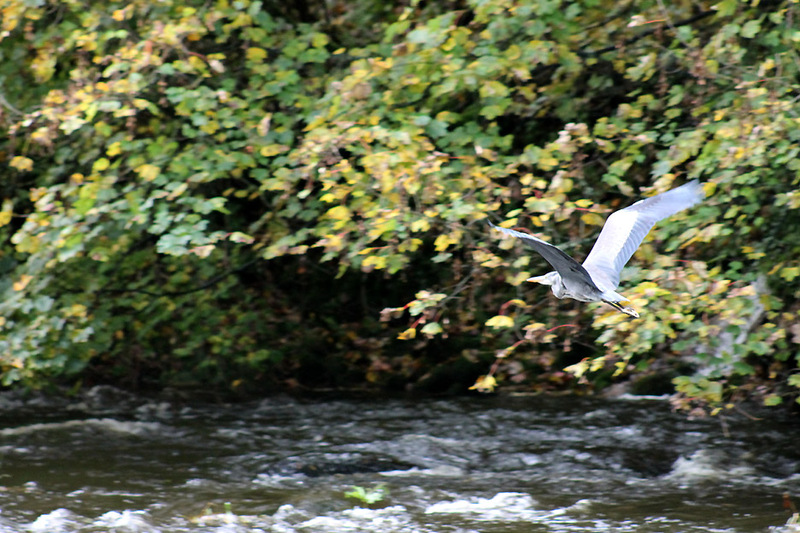 A sudden flap of wings and this fine Heron takes off and flies up river and out of camera shot. At least these will stay still while I take their photo. 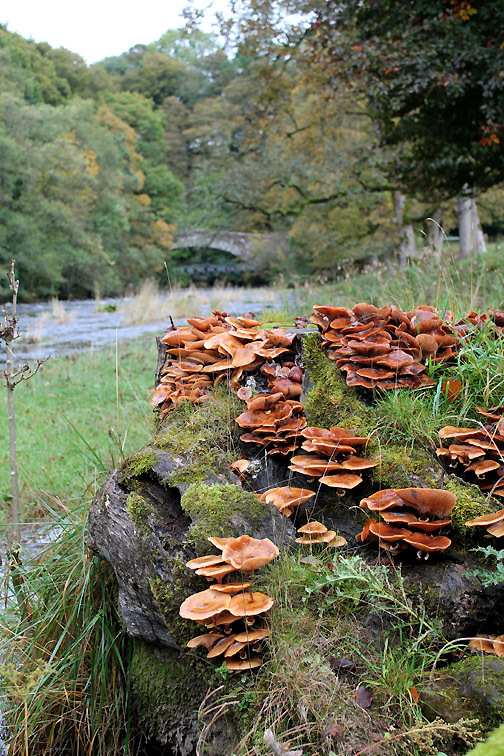 The fungi cover an old tree trunk down by the river. 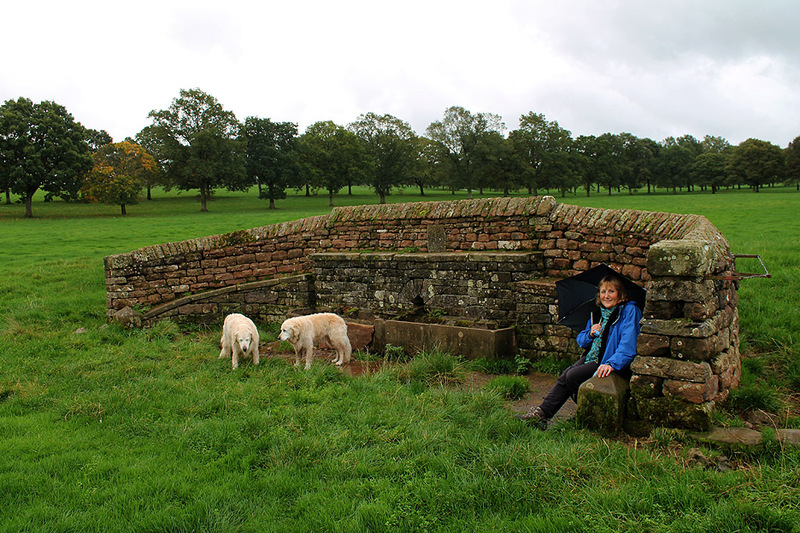 A fine stone arched bridge can be found at the bottom of the paddock. 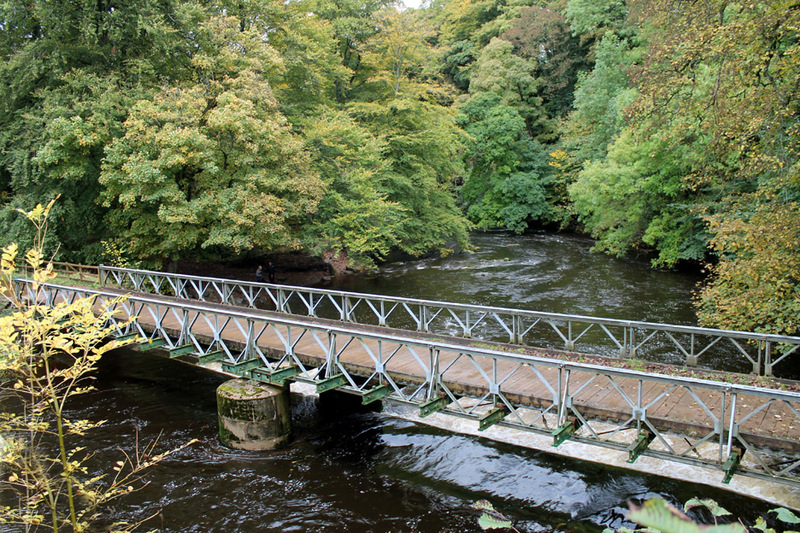 Low Gardens Bridge leads across into Yanath Woods . . . a more modern iron bridge beyond appears to carry any estate traffic. 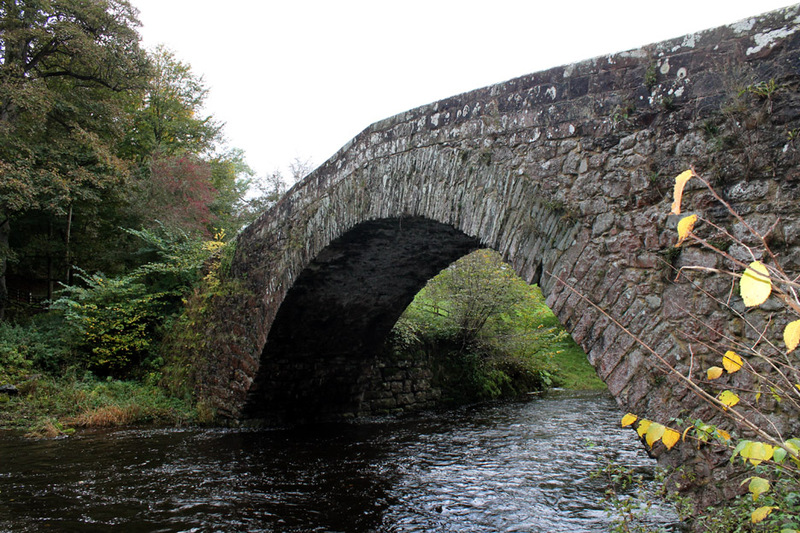 A classic Bailey Bridge, probably erected by the army during their war time occupation of the Castle, but still in use today. Crossing and then returning by the iron bridge, I get a fine view of the stone arch. Walking back towards the car we pass by the Maple that we saw earlier. It is even more dramatic in colour close up. Crossing the paddock we pass these old horse drinking-troughs. The umbrella is up . . . that must mean another passing shower. Back to the Church . . . where we left the car. Just a small walk round the grounds but a very pleasant one. 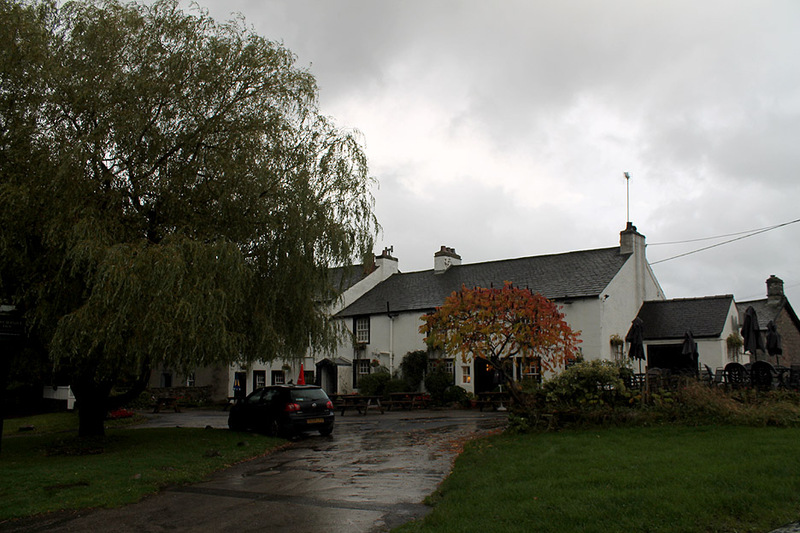 that crosses directly into the village of Askham. It is just after four thirty . . .
Hi Roger and Ann - the poles - they are an obstacle for a carriage driving competition. You should go to the game fair next year, it is awesome to watch a team of four negotiating those obstacles at speed. 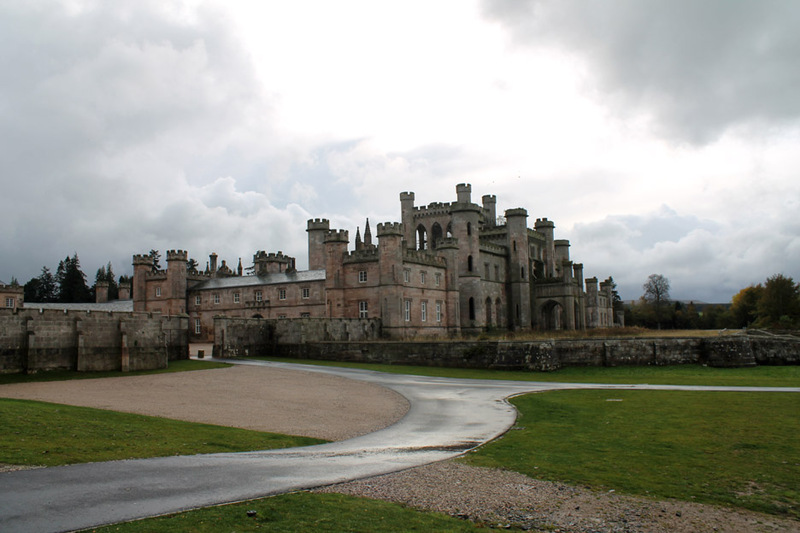 Hi Roger, The assortment of poles on your photos from Lowther Castle looks like a Cross Country fence for eventing horses. It can be jumped in various ways depending on the difficulty you wish to create. 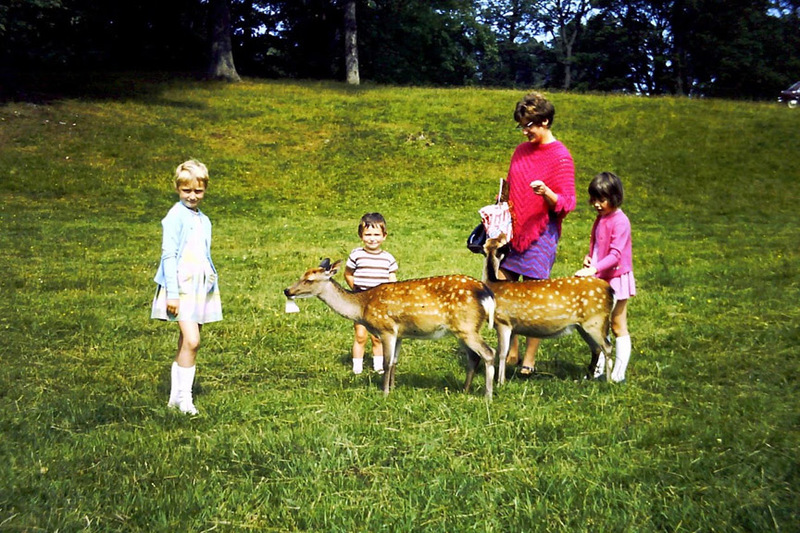 By the way, when we were younger (quite a long time ago) the grounds were home to a wild life park and there were a lot of deer grazing. It was a very pleasant day out, picnic tables etc. I am the one with blonde hair, the boy is my brother, he's been at your house before to collect calendars. I am now 50 so it was a while ago! Photo is from old slides converted to photos. Keep up the good work! Kind regards, Judith. This site best viewed with . . . an invite from a friend. 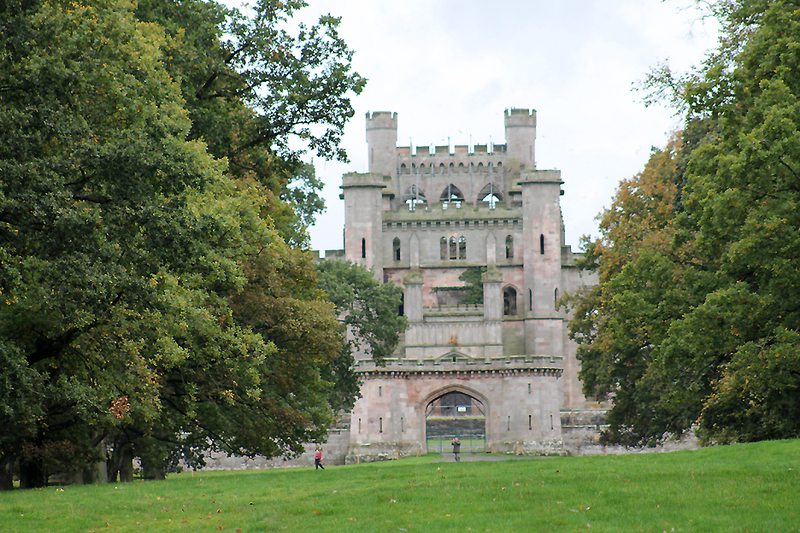 A previous time up here - Our first time in the Castle and grounds so sorry no other photos on file.